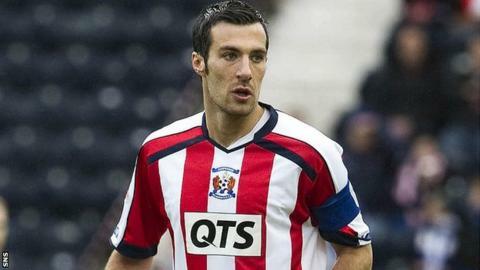 Kilmarnock captain Manuel Pascali will miss the rest of the season after a hamstring injury ruled him out for five months. The Italian defender will have surgery next Thursday. "I went off after 75 minutes against Hearts because I heard a weird sound coming from my hamstring," Pascali told BBC Scotland. "I thought I'd just pulled it. We did the scan on Monday and got news that I'm going to require an operation." And Pascali added: "It's a complex injury because, basically, one tendon of the hamstring took part of the bone off. "So I have to get surgery to put the bone back to where it was originally. "I'll have to wait until the bones are healed and then we have the boring part of rehab." It's the 31-year-old's second major injury in just over a year after breaking his leg in 2011/12. But although disappointed, the charismatic Italian won't be downbeat about this latest setback. "It's part of football," explained Pascali. "I'll always be smiling and see the future with happiness, I always think there's worse in life. "So just another five months of holiday and next season I will be ready. I hope then to be on the park for more than one year without injury." While Pascali was sidelined last term Kilmarnock went on a good run, winning the League Cup with a victory against Celtic in the final. And with this latest injury coming at a time when the club is looking forward to a quarter-final tie with Hibernian in the Scottish Cup, the defender hopes his absence may prove fortunate again. "Maybe, if we can win another cup, I will ensure next season that I have another injury to win another cup! "I'm gutted about it but I'll just smile and see if I can get back as soon as possible." Kilmarnock manager Kenny Shiels has several injury worries for Saturday's game against Aberdeen. Mo Sissoko has a virus and is a major doubt, while Jeroen Tesselaar is also doubtful with strapping on a hand injury and is doubtful. Killie's only recognised central defender for the match is Ryan O'Leary.